On Economics: it is almost predetermined that we will have other financial bubbles and manias at some time in the future (human nature not abolished); that we won't have another enormous one before 2025 (memories are short but not that short, and regulation is fresh - so not enough fuel in the tank); and that we will still have uncomfortably big banks (I wish we wouldn't, but they are too powerful politically). More interesting is to look at the odds for/against serious protectionism. Banking reform in the sense discussed - small banks, active bubble management - would require a supra-governing body. Perhaps a small group to begin which allows others to join? Pockets of something that works will attract others? But to get others to come in, it cannot be dominated by the US or by Europe (like IMF and World Bank) who look after their own first. This means looking to the good of all, rather than just the good of a few. Major additional point is that small banks or big are both vulnerable to insidious threats such as CDOs. Yes, a small bank that knew that it might fail would be more exposed to critique by its depositors, but when did Joe Average understand bank exposure? He or she has to rely in the media, which means bubbles get replaced by bank runs and panics: back to the 1780s. A more sensible approach might be to ban those instruments capable of distributing risk in the manner of CDOs, or to make the risk more understandable. It may be, too, that what we need is less smaller banks than less astrophysical quantities of these instruments floating about. There are supposed to be hundreds of trillions in derivatives being traded at the moment. What for? What are they for except confetti money? I am not sure the current system will survive. Not sure what will replace it, but it isn't working at present. Only stop-gap measures… and the great divide continues to widen between the haves and the have-nots. If it doesn't happen, then I fear that the world will become increasingly fragmented and volatile, aggressive and protectionist. There will always be bubbles because people are always inclined to trust the herd. But we do know that bubbles tend to come from specific arenas - property, in particular - and are always associated with clear deviations from rational ratios. Why can limits to these not be built into global banking regulation, by treaty if necessary? I want to make a comment - maybe rebuttal - of Comment 3. I have taken a lot of material from James Montier (2012). First, it is naive to assume that regulation is founded on solid economic models, or that finance proceeds through strict rationality. One concept that has underlain a wide range of modelling is the Capital Asset Pricing Model, or CAPM. It holds that a portfolio is trying to maximise return whilst minimising volatility, which it sees as identical to risk. Transaction costs and other illiquidities can be ignored. All investors hold mean-variance-efficient portfolios: that is, they are all trying to apply the CAPM! All investors hold the same correct beliefs about mean variance and covariances of securities. Every investor can lend all she or he has, or can borrow all she or he wants at the risk-free rate; or alternatively, that:. It is possible to take a long or short position of any size in any risky asset. A minute's experience in he real world shows us that most, if not all, of these idealisations are far from true. However, this did not stop LTCM pursuing a strategy entirely based on a CAPM-derived model, and it as we all know, it failed catastrophically. These concepts are, however, still at the heart of many automated trading schemes, of means of reconciling portfolios and of assessing risk. Indeed, the concept of "Risk" itself needs to be re-thought. Risk is not and never was synonymous with volatility. If a business in which you have invested fails, it has no volatility - but the risk is infinite! What we should be measuring is the probability that a capital holding will be damaged by actions that we propose to take. There are three common causes for such damage: buying overvalued assets, buying assets which have a bad underlying business model or are otherwise accident-prone and, third, ignoring risks inherent to the financial system as a whole, whether from inflation, currency exposure or more systematic crises. None of these are perfectly predictable - if they were, we would not need markets - and none of them are accounted for as exposure in the banking system by anything but asset price. The plain fact of the matter is that people, and therefore markets, are highly irrational. For example, a wide range of experiments show that even though we know that a seemingly authoritative source is no better than random as a predictor, we nonetheless still give it considerable weight in our decisions. We tend to anchor our ranges for the "reasonable" in numbers and views to which we have recently been exposed. For example, if you ask people to write down the last four digits in their telephone number, and then ask them to guess the number of - for example - doctors in their capital city, those with high telephone numbers - eg 7889 - will reliably write down higher estimates than those with low numbers, such as 1002. Our view of the reasonable is often as much calibrated against unrelated ranges and views to which we have been exposed than it is grounded on "science". Markets are prone to herd instinct, and whilst some interpretations of this allow for a certain sort of rationality - of buying in a bull market, for example - evidence nevertheless shows us that we tend actively to discount contrary or dissonant signals, and to over-amplify those which confirm us in the 'wisdom' of the crowd. Value at Risk (VaR) models calculate the expose of a bank to a portfolio of risks. It works its way through the portfolio, looking at the likelihood that something will fail, and multiplies this by the sum at risk. In order to keep matters simply, the VaR assumes that risks below a certain threshold of probability are safe - typically a chance of one in a hundred of their occurring. Risks that are more than 99% safe are therefore ignored. Value-at-Risk models therefore ignore the "long tails" of most distributions. This creates an incentive to take excessive but remote risks. Consider a bet against a toss of a coin, where the risk of failure is 50%, much worse than the 99% "safe" threshold. If you bet $100 on tails, then your VaR will be $100. Compare this to a more complex bet, one where you offer 1023 to 1 odds that heads won't come up ten times in a row. Head will come up in such a sequence, on average, in one in 1024 times. You will tend to win 1023/1024 of the time, that is 99.9% of the time. This is better than the typical 99% threshold of the VaR, so it evaluates this a a safe bet. Suppose that the bet is the same: $100. Then it follows that one time in 1024 times, you will exposed to a loss of $100 times 1023, or $10,230. Write this as a $100 million bet and the implications are clear. However VaR evaluates this as a safe exposure! The problems inherent in VaR are further amplified by the use of short runs of data to estimate the inputs. If the immediate past is a period of tranquillity, then the future is held to be the same. If a risky asset, let's say a CDO, happens to have been less volatile than U.S. treasuries over the last couple of years, the model says that the CDO is less risky than treasuries. Such limitations are inherent in all models, and the more complex and opaque the model, the worse that exposure tends to become. Worse, if a bunch of similar models agree that such an asset is safe, then its alleged safety gets confirmed. The slicing off of risk, and the use of the remaining assets as a AAA asset against which to borrow, was responsible for much of the intra-bank growth in credit in the run up to 2007. I began by saying that the fundamenals of markets are not clearly - or even opaquely - rational. The indices used in reporting and regulation do not make much sense. My second point is that regulators are often selectively blind to signals that they do not wish to see. 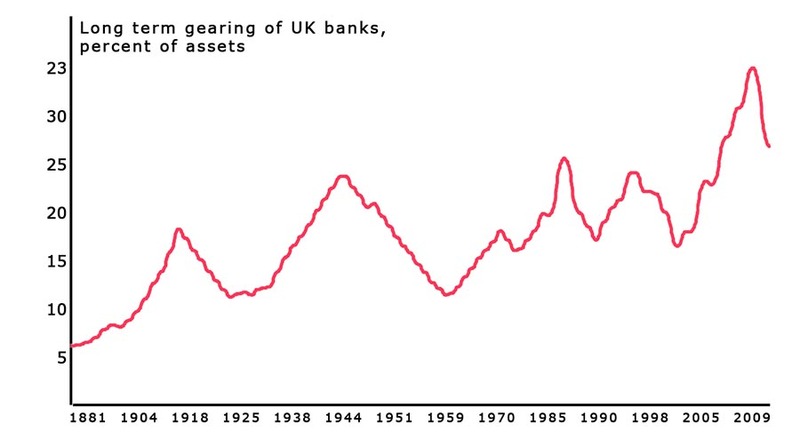 The figure shows bank gearing over the long term. Similar pictures are available for personal debt, mortgage debt, house price inflation. These are not sudden events. the arise over the long run, and regulators have both chosen both not to see them and not learn from overseas experience. The Euro may fail, or reduce in scope, However, for it to work something like the Sr. Barroso proposal has to come into play. If that happens, it will be an important step, not so much for the Euro as for the various central banks and regulators around the world. Here will be a working - or failing - model of how to reduce currency volatility and how to manage state and banking extremes. Bretton Woods was an amazing achievement, formed amongst 44 nations during the end game of World War two. Participants agreed to tie themselves to the US dollar, an early ERM. The result was 25 years of stability. One of Nixon's blacker marks was his rejection of the convertibility of the dollar into gold, which led to the unwinding of the system and arguably to stagflation and the ills of the 1970s. To consider just how extraordinary this was, there was an acute shortage of dollars available to the non-US participants. America was running a huge balance of payments surplus and the other allied nations were crippled by war. To make Bretton Woods work, the Marshall Plan was established to, essentially, ship the required dollars to the participants. Between 1948 and 1954, the United States literally gave sixteen Western European countries $17 billion, an immense sum in those times. Communist expansion was probably halted by the political stability that this gave. "Countries to agree EU spending between 2013 to 2020 period. The next step is a banking union: that is, EU-level bank supervision, a joint deposit guarantee fund and a new fund dedicated to bailing-out big banks which get into trouble. The next step, to be agreed as quickly as possible, is a fiscal and political union. The EU countries would then issue joint bonds, co-ordinate tax policy and co-ordinate national spending on everything from health care to schools and social welfare." Quick note to say that Larry Summers and others have just published a review on the relationship between central bank independence from politicians and the management of inflation. They find that whilst there is some relationship, it is far from clearly absolute. We may have tended to deify central bank governors too much, as the causes of the 2007 crash were at least in part down to the permissive regulation carried out by the (US) Fed.